As Hurricane Florence tracks toward the East Coast with predicted windspeeds up to 150 mph when it makes landfall Thursday, storm prognosticators are busy trying to forecast its effects for local residents. 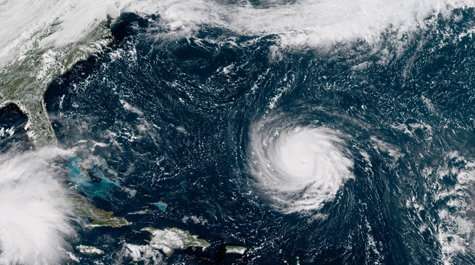 But one William & Mary ornithologist has his own predictions on what Florence will mean for birds and birders. Chancellor Professor of Biology Dan Cristol says that the winds and rains of Florence will be a boon to birders wanting to add rare species to their state lists—compilations of species sighted within each state. On the other hand, it's the height of fall migration and a powerful storm tends to take a heavy toll on songbirds. "What usually happens is that the storm will drive massive numbers of seabirds up from the Caribbean," Cristol said. "We're talking about petrels, shearwaters, boobies, terns, frigate birds. In events like this you can end up with albatrosses on the New Jersey Turnpike. It's happened." These marine species are evolved to take off from water, Cristol explained. Savvy birders know that the seabirds will seek shelter in the first large inland body of water they encounter. "For a storm like Florence, that large body of water is likely going to be Lake Kerr down on the border of North Carolina," he said. "Birders are going to go there to fill out their state lists—or just to see large numbers of lost birds, which is what hard-core birdwatchers live for." Nick Newberry, a former student of Cristol who graduated in 2017, says he is watching the track of Florence and intends to head out to Lake Kerr—or wherever the seabird action is. He's not been to Kerr, but Newberry is an experienced storm bird-chaser. "The last hurricane that brought in birds like this was Hurricane Hermine in 2016," he said. "It didn't make landfall, but it was close enough to blow birds into the Chesapeake Bay. I was on Island 1 of the Chesapeake Bay Bridge-Tunnel with about a dozen other birders." Hermine blew in a number of rarities, Newberry said: "We saw black-capped petrels, which are usually out in the Gulf Stream, about 60 to 80 miles away from Virginia. We saw a white-tailed tropicbird, also usually out in the Gulf Stream." Newberry explained that he will follow the eye of Florence, as that relatively serene storm center is where the birds are. "The eye kind of traps birds. Birds don't want to fly out of the eye, because the eye wall is usually the strongest, most intense part of the storm," he said. "So, you look for bodies of water that the eye passes over. Birds see the water and they might settle down." Songbirds are especially vulnerable in large storms, Cristol added. "Many of these songbirds are migrating right now, and many of them migrate over the open ocean," he said. "They don't have a place to go, unless they find an island or a boat or something. If you're in a boat out near one of these storms, sometimes birds will just rain down on you." As of noon Monday, Florence was moving west toward the Carolinas with peak sustained winds up to 130 mph, making it a Category 4 hurricane. According to NOAA computer models, impacts could reach Virginia as early as Wednesday. For more information about the storm, visit the National Hurricane Center.